Next, in our comparison of Rider-Waite (RW) and Angel tarot, our Dreamer comes to 9-The Hermit. The Hermit is also known as the Sage or the Wise Old Man and he represents time alone. It may be that we need time away from the influences of others; the collective. It could be that as we create in the presence of others, we allow ourselves to be influenced by the judgments and opinions of others, which can cause us to make changes just to please others. The Hermit indicates it is time to retreat either physically or perhaps just spiritually by going inside deep to hear that voice within. It is time to move away from the collective and work one-on-one with a mentor. 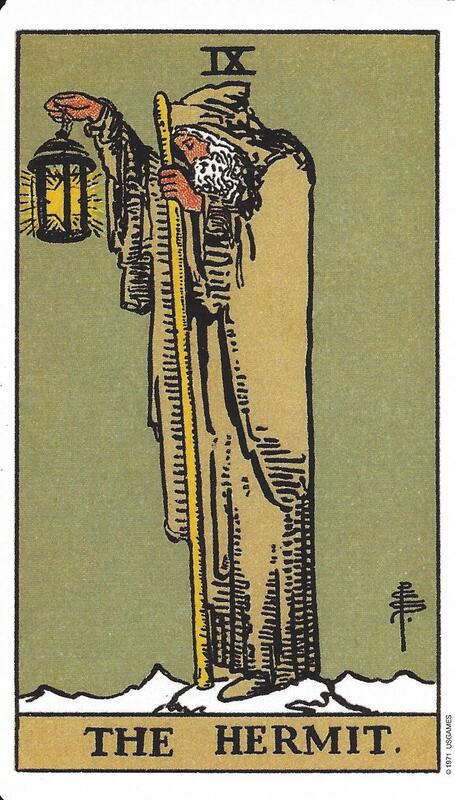 The biggest symbolism of The Hermit card is often found in the lantern. The lantern is a beacon of light. If you look closely, the RW tarot shows a star within the lantern. Some say it is representative of The Ancient of Days or God as told in the book of David. Others interpret the lantern as symbolic of Diogenes, the Greek philosopher who isolated himself in a life of poverty. Diogenes is said to have carried a lantern during the day in search of an honest man, which he never found. In Angel tarot, the light shines in order to light the way for others in search of truth. The fireflies flittering around the lantern represent our inner light. Fireflies are also a sign of magic in the world. 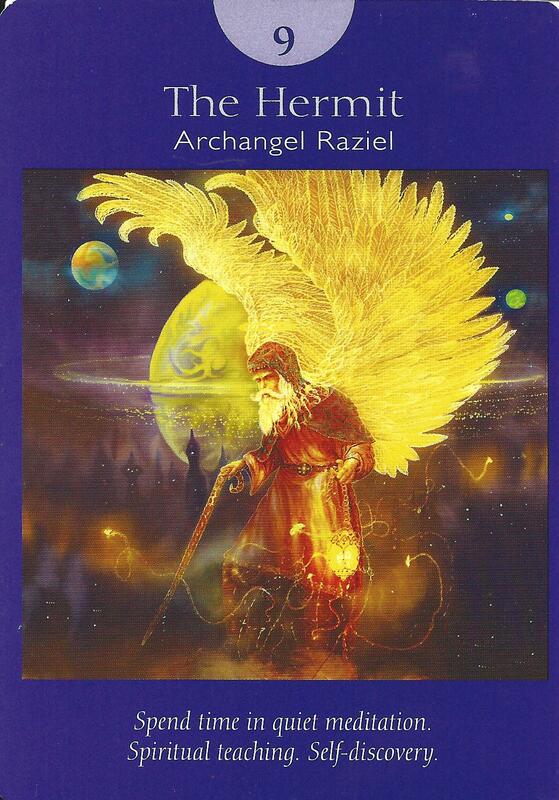 The Archangel represented on The Hermit in Angel tarot is Raziel. You may recall Archangel Raziel also appeared on 1-The Magician. In The Hermit, Archangel Raziel continues to hold his magic wand (the cane in Angel tarot and the staff in RW tarot). The Magician showed us that we do have the ability to create. Now The Hermit asks us how our creation can be of benefit to the world. If The Hermit is drawn you are being asked to meditate and contemplate. You may want to seek out a mentor to assist you with a project as The Hermit represents spiritual teaching. Perhaps it is time to share your creation with the world or to share your experiences on the journey thus far. If you are unsure call upon Archangel Raziel to help you find the golden nuggets or pearls of wisdom you seek in quiet meditation.